This morning I received an email from someone I didn’t know called Dane Atkinson. An annoyance of mine is businesses who send emails from employees rather than the business name in an attempt to get people to open their emails. This is a pet peeve of mine (I’m looking at you PostPlanner) but that’s not what today’s rant is about. 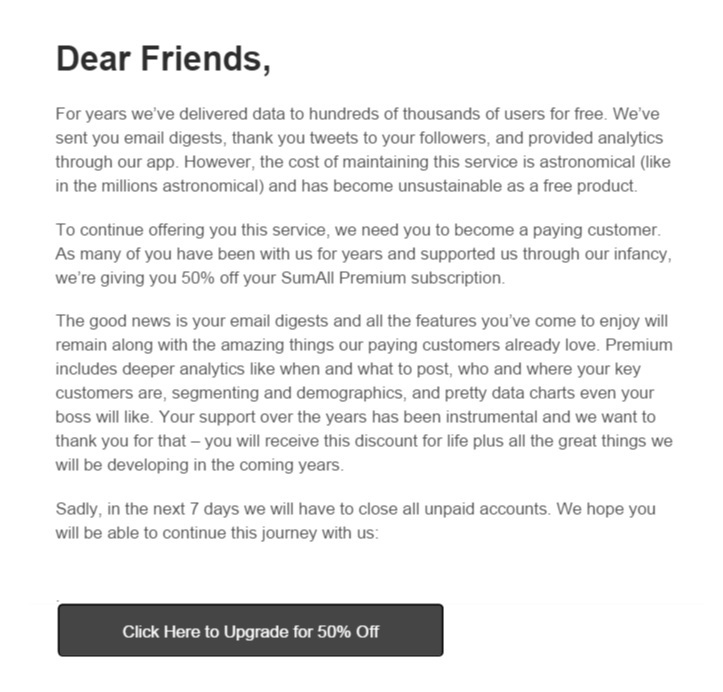 Instead, SumAll (ahem, Dane) was letting me know that their free service is is becoming premium only, and at a cost of $99/month, or half price for existing users. First of all, that is quite the price rise (from free to $49). Luke makes a good point. Second, I only ever used SumAll for the autotweets for thanking people who retweeted me. I never used it for the analytics or any other features. For the time being I find Twitter’s own analytics sufficient. My confession is that I found that SumAll provided me with a bit of a cheap and frivolous ‘thanks for the retweets’ post each week. Now, I make every effort to respond and reply when I’m @mentioned or if there’s a conversation, but if there’s a simple retweet without a mention, these get a bit lost from me. That’s where SumAll came in for me, it helped me to keep track of my retweets. Promote and inform – your programs, services, events, ideas, opinions. Build relationships – reply, respond and retweet so people are heard and appreciated (both stakeholder organisations and community). Offer value – provide links to third party articles or interesting content. 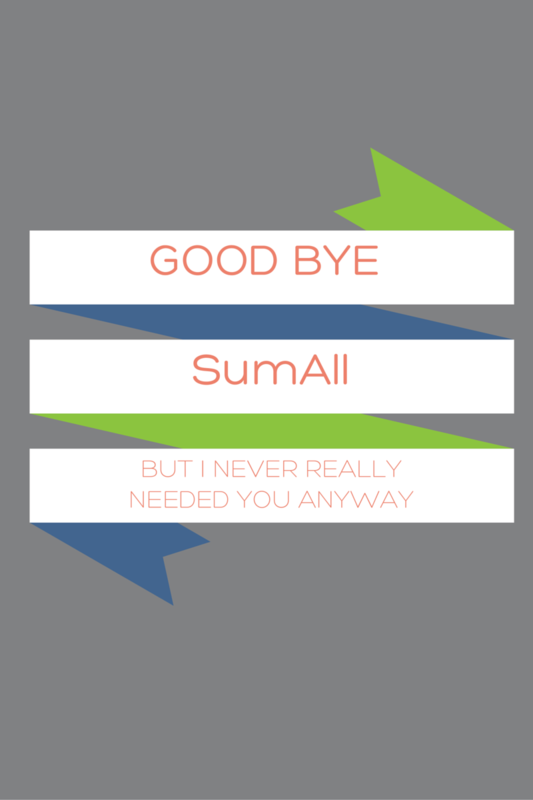 Arguably, SumAll attempted to build relationships but it was extremely shallow and, probably pretty pointless. Not everyone is sad to see SumAll’s change in direction. I also recommend that when you do wish to retweet, always retweet with a comment so you can add some context or purpose behind your retweet, and consider tagging in the original tweeter when relevant. From now on I will keep engaging at a deeper and more meaningful level on Twitter and all my social platforms. Let me sum up by saying to my Twitter followers I apologise for my SumAll posts over the years, and thanks for the retweets. Grab the 2019 Health Days & Events Calendar Now!